Good feedback on the rail and stile video. Finish is applied to the dartboard cabinet and it is 100% done. It looks so nice…but I’m holding off on showing pics until the video and article series gets closer to completion. I made a few mallets this week. Hoping to have 2 videos on my main channel this week. More gifts for the holidays. Centerpiece tray? 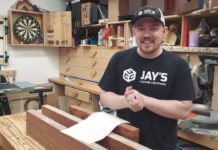 City Hardwoods Meetup December 9th. 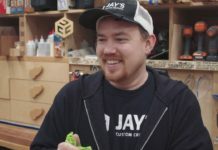 Jay, what BB’s are you using for the mallets. I assume the heavier the better? I’m using regular Daisy bb gun size. Heavier isn’t always better. I’ve got a couple mallets that I don’t use because they are too heavy. What time is the meetup at city hardwoods? Me and my wife will be in town visiting family so hopefully I can sneak out and come say hey. 11am to 3pm. We’ve got other arrangements later that night so I’ll be out the door right at 3pm. Still coming to birmingham tomorrow?